As a kind of overhead gantry crane, port crane usually works periodically and intermittently in outside or several poor environments. This material lifting machine can be divided into three types. First is the small and light gantry crane. Second the jib crane and then is the bridge-type crane including the gantry crane, container gantry crane and rubber tire gantry crane. 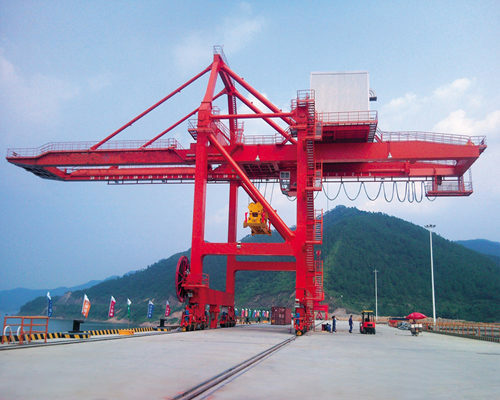 Due to the big lifting capacity and high working level, a port crane is widely used in harbor, shipyard, and port. When weight of the cargo need to be lift is not clear or beyond the limited. Some components of a port crane are damaged or can’t work well. The working environment is so dullish that workers can’t see equipment or people explicitly. Only under the condition that these workers obtain related qualification certificates, they have the right to take on the job associated with port cranes. The operator should do these things as following to ensure the safety of gantry crane. First, they should test or correct some operation behavior that against rules. Once this unprofessional operation take place, they have to deal with them timely. If the situation is so emergent, they have the right to stop the materials lifting machine and report to the leader. Second, they should build some safety documents about the port crane, and reserve it well. Third, they have to make a plan to examine the port crane in a certain period, and supervise the implementation of this plan. Before using the port crane, the worker should test several elements carefully, which includes hook, detent, wire rope, and safety devices. Once unusually condition happened, they not only should shoot these troubles, but also record it seriously.